It is summer and we have another education oriented giveaway. This place sounds intriguing and worth the look. Enter the giveaway for your chance for a four month subscription. Enter before 8/2. Good luck. Disclosure: Java John Z's is not responsible for prize. 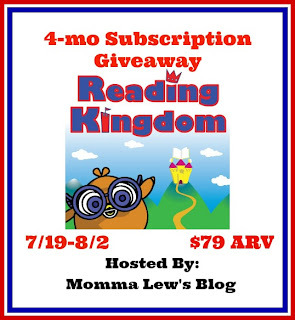 If you have any questions about this giveaway please send an email to Momma Lew's Blog at reesann723@yahoo.com. All entries are optional, if you do any of the tasks you can collect the entries, but if the winner task is a task you did not complete, a second winner will be chosen. Winner has 48 hours to respond by email to claim prize or a second winner will be chosen. I try to follow up with a real life experience to help them connect with what they read. Mostly we play games together that are for 'learning' but we make it fun by talking about it and doing it together the first few times. It is nice to see her doing things by herself later that she learned just by watching, too. Kids pick up on things FAST! My trying to turn it into something they want to do as opposed to have to do. I also set obtainable goals that have rewards.